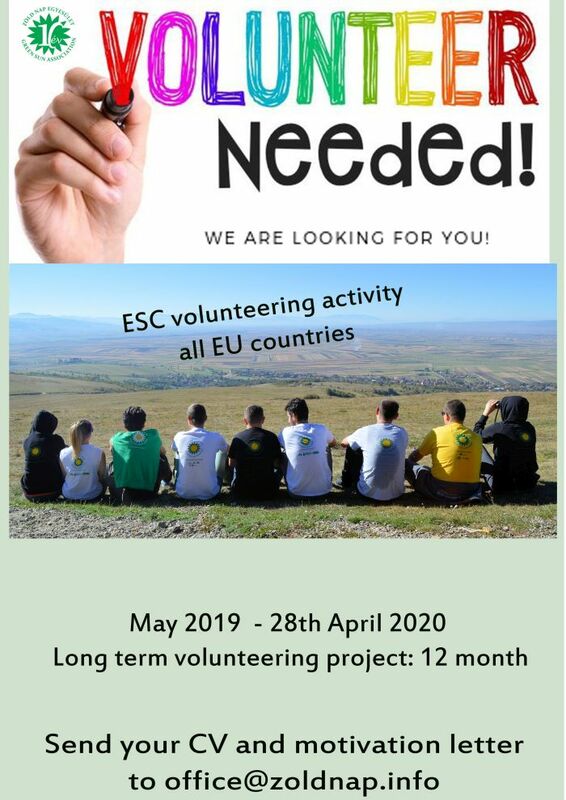 Green Sun Association is searching for a volunteer for an already approved ESC project in Transylvania, Romania. The project is financed through the European Solidarity Corps (ESC) programme of the European Commission. The venue will be in the small town of Targu Secuiesc. This project is coordinated by Green Sun Association with more than 7 years of experience in coordinating ESC/EVS projects. 1 volunteer from all countries who can start at 4th May 2019. The finishing date is 28th April 2020 (12 months). To apply for this position please send your application till 18th April 2019, to Ráduly Attila at office@zoldnap.info. The interviews will be held after the 19th April 2019. Project related to sport, environment protecting, rural areas, training and partnership activities. Will support the activities of the association, specific activities, workshops, courses, outdoor activities and activities that they propose. Different articles and materiales for the web page and Facebook, create videos, dissemination activities, materials, articles, pictures, etc. . Applications should include a cover letter, CV (Curriculum Vitae - a short resume of education, trainings, and personal skills), possible references, and contact information. As we will held the interviews trough Skype please do not forget to includ your Skype user as well. We will contact you soon AFTER the application deadline is over. For further questions you can contact with us via e-mail. More information about the project you can find in the attached call.